It’s been a while. I’ve been writing exams. Some were okay. Some were very terrible. (*wipestear*). But I have a very wonderful news. I’ll still go ahead to post it here. But do well to stop by the link above. It always begins with this numbness on the spot where I know my heart lies, my insides become heavy as though every organ has just been assigned a gruesome task – twist and pull. Then my mood dives, my children become intolerable and their whines irritate me. During the day, I eat everything, anything – like a lactating mammal, and at night, I get doused in my own tears. It is an unending cycle. Her words made me recoil further into my shell; and because pain can be so sharp that it cuts off your tongue, I said nothing. It was true that I needed a listener but what I was scared of were their responses. “Stay for the sake of your children” This was bad advice. My parents always made such comments whenever I tried to confide in them. Once, my mother told me to “Pray until something happens” I did, nothing happened. I had gone to see my Adanne and she told me about the sheer joy of perseverance and waiting on the Lord. She said these things to me while I lay on her couch with the broken skin on my lips and the sagging bags under my eyes. I had not planned my life this way; I had wanted to make a difference. I thought of those nights in the dark dormitory of Queens College when Ifeyinwa and I whispered about the change we wanted to effect in the world. Yes, I think otherwise now, but I know I tried. I have come to understand that no one fixes an appointment with fate; it does what it wants; it crosses you; it unsettles you; then you try to endure; then you try not to die. If the agony of watching your best efforts wasted could kill, I would have died that Sunday afternoon when he threw my pot of stew into the waste dump behind the house. If words could kill, I would have died the night he hurled his “I resent you.” at me. That night he came back from work and pushed me to the chair, thrusting his fullness into me; I did not die. But I was broken. Those groans announced the beginning of my becoming a living, breathing, emotionally dead woman. I abandoned myself, forgetting what it felt like to be human, regarding myself as something I knew but not intimately. I was dying slowly – life as I knew it was gradually fading away. I later realized that the pains I had swallowed like tiny pills would soon become my death. I questioned if giving up my dignity in the service of family and marriage was the right thing to do. I now know how a person can cover her wounds until they fester and rot and I now know how the smell of it can crowd a whole room. And so the day I packed my bags and dusty certificate, the day I finally made up my mind to leave and find myself; I did not die. Because marriage is like a battlefield, a warfront of ironies–sometimes, a gory ground of bloodied resolve; and, other times, a beautiful pillage of swollen hearts and sinking jaws. Some women get maimed in the war. Some die in the war. 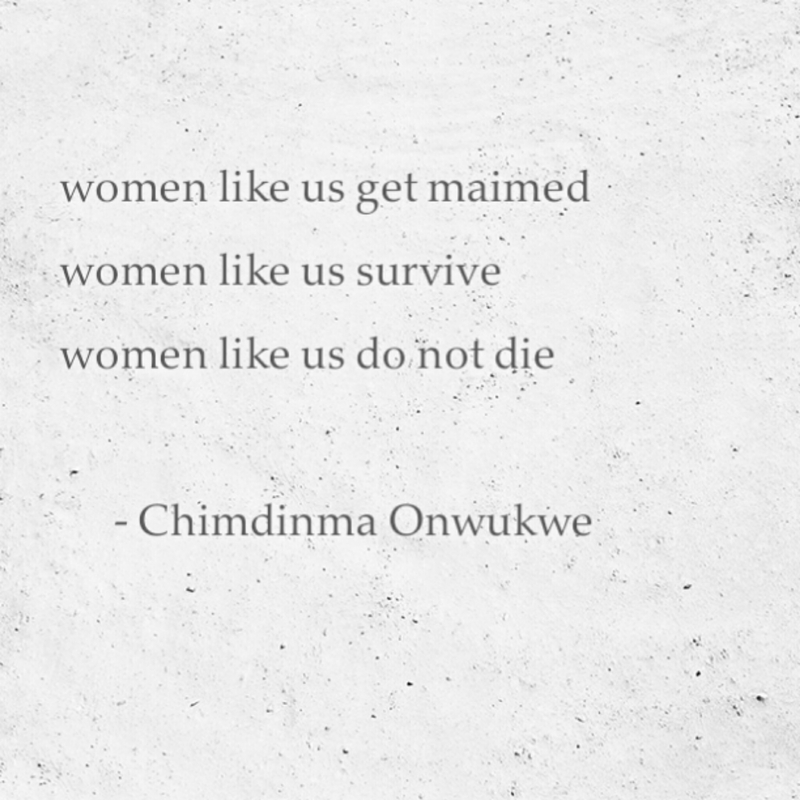 But women like me get maimed and survive. Women like me don’t die. I’m so sorry I wasn’t able to reply you sooner. I would send you a mail soon. Thank you so much. Congratulations Chimdinma! Your greatness just begun. Congratulations dear, and your story is Amazing!!!! I can’t put to words how much I love it. You can get up, and leave that pain that weakens..and destroys you. You can believe in the Lord and he would work things out. You do not have to face that abuse all your life because there is always a choice. Believing in God.